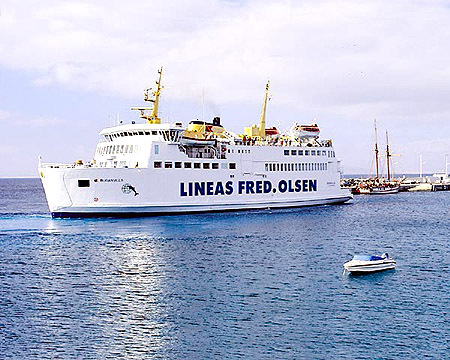 This page is devoted to postcards and photographs of the Scandinavian Ferry Lines vessel Betula, which later served as the Lineas Fred.Olsen ferry Buganvilla. 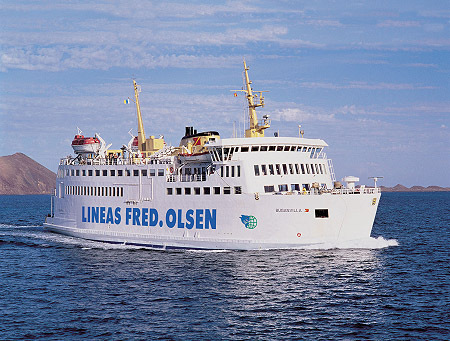 Betula was built by Meyer Werft, Germany, in 1968 for Scandinavian Ferry Lines' Linjebuss service between Helsingör and Helsingborg. As built she was 2291 gross tons and carried 800 passengers. and 75 cars. Additional accommodation was added in 1985, increasing size to 2452 gross tons and capacity to 900 passengers and 105 cars. 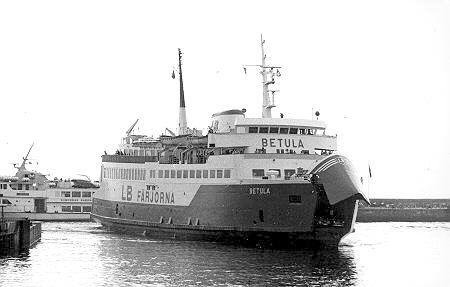 Betula had two sisters, the Regula of 1971, and the Ursula of 1973. 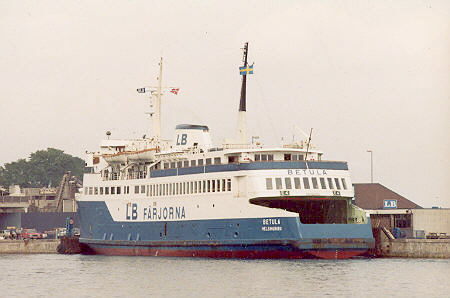 In 1991, Betula passed to SweFerry, part of Scandlines. 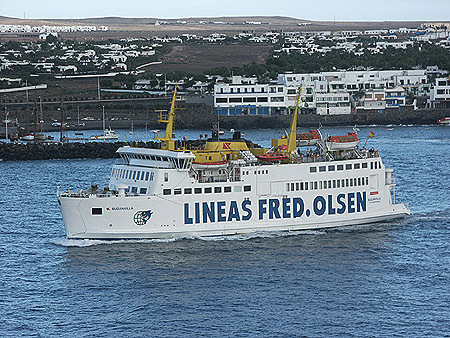 She did not receive the complete Scandlines livery (unlike her sisters), before sale to Lineas Fred.Olsen in 1992 for their Corralejo (Fuertaventura) to Playa Blanca (Lanzarote) service, and was renamed Buganvilla. 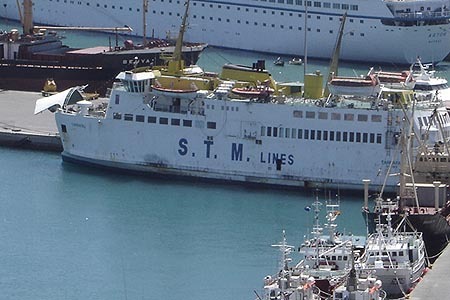 She was replaced by fast ferry Bocayna Express in 2003, and sold for further service as Tarrafal of Cape Verde Islands operator Sociedade de Transportes Marítimos (STM). 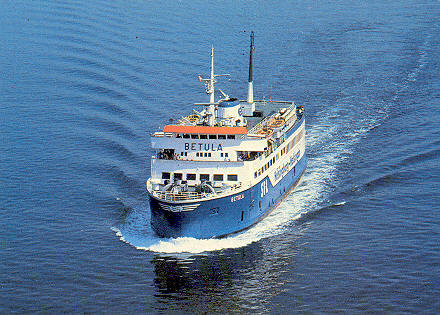 Betula was built by Meyer Werft, Germany, in 1968 as the Betula for Scandinavian Ferry Lines' Linjebuss service between Helsingor and Helsingborg. 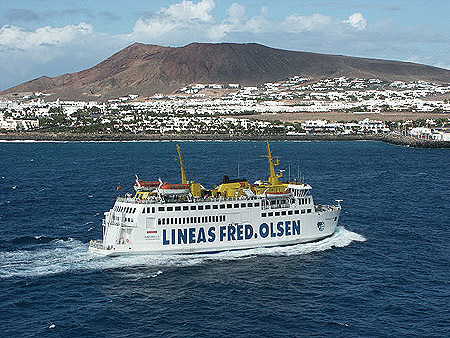 She was sold to Lineas Fred.Olsen in 1992 for the Corralejo (Fuertaventura) to Playa Blanca (Lanzorote) service. 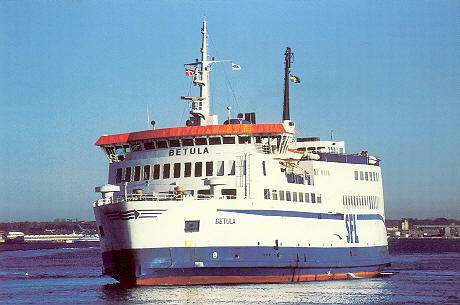 A Linjebuss International AB official card of Betula. 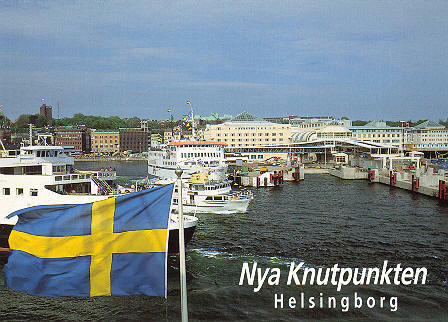 Sa-Mar postcard H8/2 of Betula at Helsingborg. 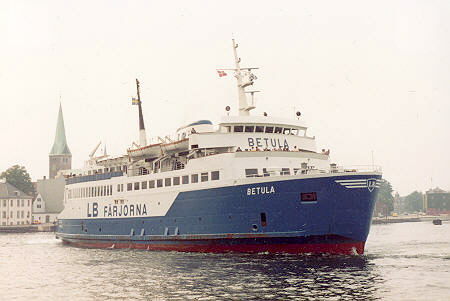 A Scandinavian Ferry Lines official card of Betula, now showing SFL logo. 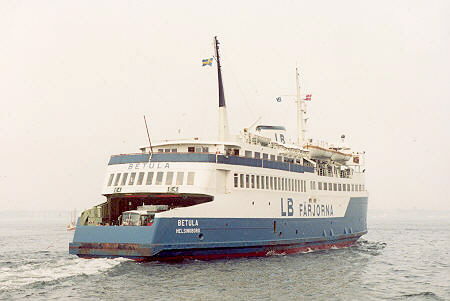 A Scandinavian Ferry Lines official postcard of Betula, in later SFL livery, following the addition of further enclosed accommodation. 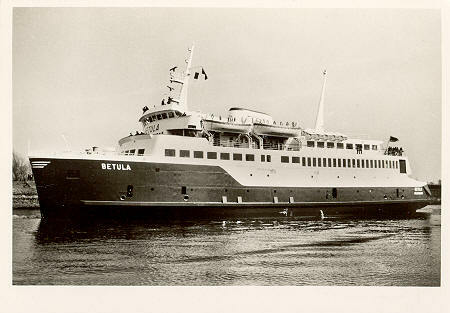 Unidentified postcard of Betula at the new ferry terminal in Helsingborg. 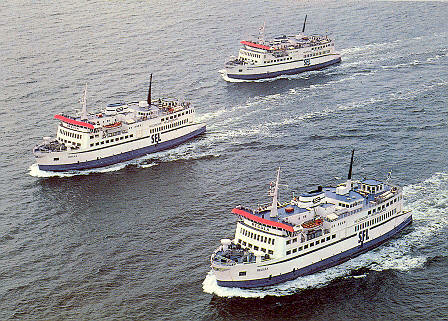 A Scandinavian Ferry Lines official postcard of the three sisters Regula (front), Ursula, and Betula (rear) in later SFL livery. 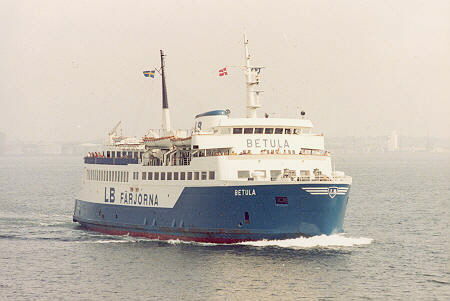 Simplon Postcards release sp1138 (issued March 1993) of Betula in later SFL livery. 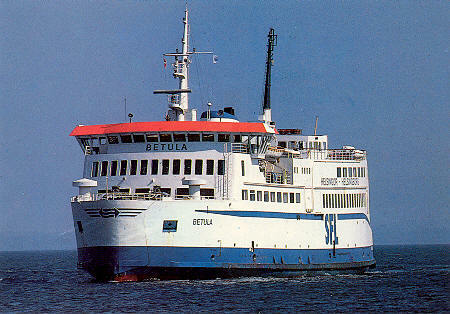 Photos of Betula on service between Helsingor and Helsingborg by Ian Boyle (August 1979). 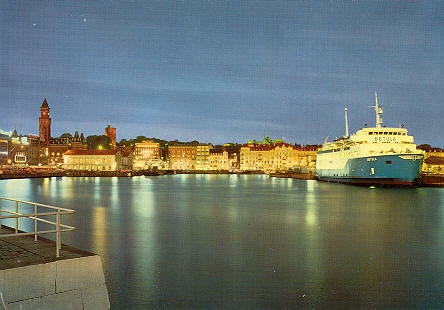 Simplon Postcards release sp1139 of Buganvilla in Svendborg, Denmark, prior to delivery to Fred.Olsen. 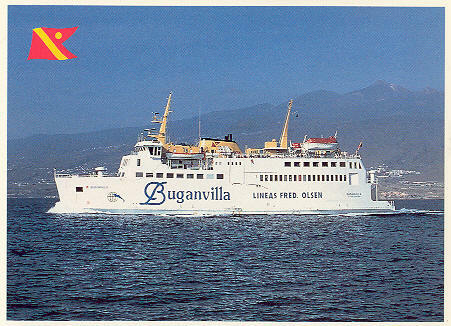 Official Lineas Fred.Olsen postcard of Buganvilla. 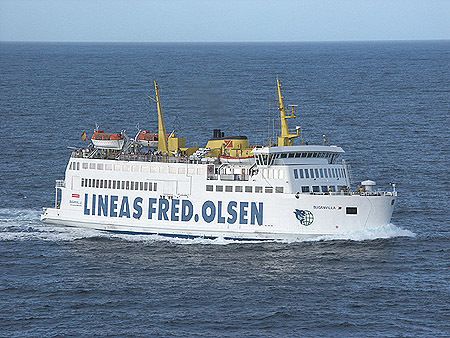 Lineas Fred.Olsen photograph of Buganvilla. 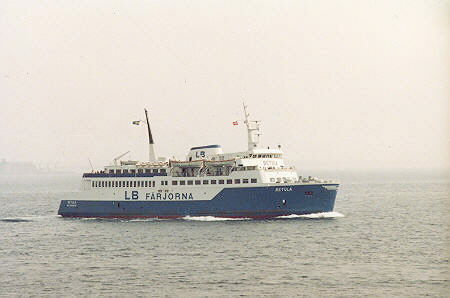 Buganvilla was replaced by fast ferry Bocayna Express in 2003, and sold for further service as Tarrafal of Cape Verde Islands operator Sociedade de Transportes Marítimos (STM). Raúl Soulé writes:- The Buganvilla, has since 19th February 2004 been registered in Cape Verde as Tarrafal, owned by the S.T.M. - Sociedade dos Transportes Marítimos, Lda. This society is a mixed between Cape-Verdians and Spanish people from Canary Islands. 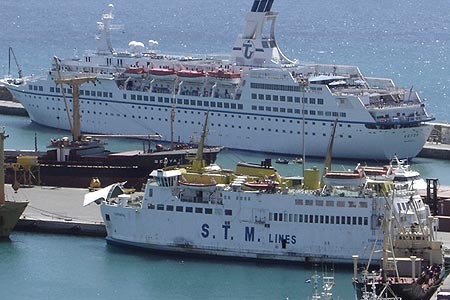 Each Tuesday at 14:30, the Tarrafal departs from Mindelo on São Vicente for the islands of São Nicolau and Santiago (São Tiago), returning via São Nicolau to Mindelo on the Thursday at 14:00. 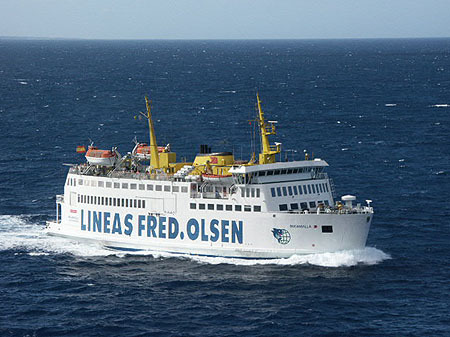 She then lies in Mindelo between Thursday and Tuesday. I believe that timings are fairly approximate. To confuse matters, at least two other islands also have a port called Tarrafal. 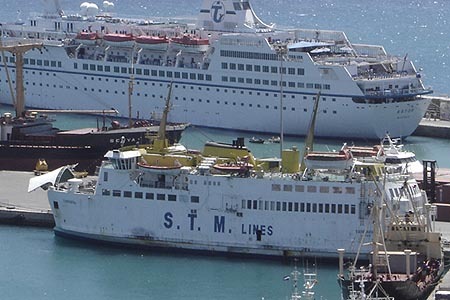 Tarrafal at Mindelo, Cape Verde Islands, 6th May 2005. Photo: &COPY; Sociedade de Transportes Marítimos (STM). 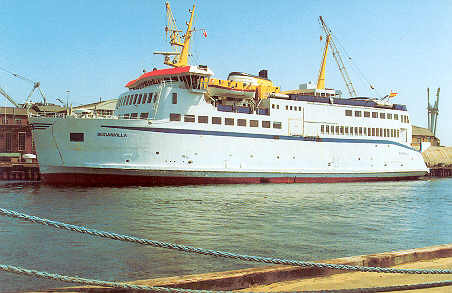 Tarrafal at Mindelo, Cape Verde Islands, 6th May 2005. Photo: &COPY; Sociedade de Transportes Marítimos (STM).